In honor of Abbey's marching band making state, her sophomore year, and heading to Bowling Green. I am sharing a picture of me heading to state in Bowling Green, my sophomore year. 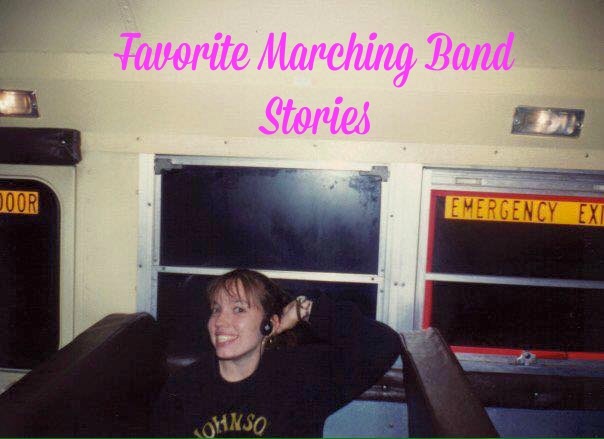 I'm also sharing some funny band stories. Some of these are from my experience. Some are Abbey's and some belong to my sister. I assure you all stories are 100% true. Once we went to state and our band director took us to the mall to reward us for our hard work. While walking through the mall I heard "Hey baby!" I turned around and saw a seriously tall guy. We talked and he was super cute and funny. But I lived 5 hours away and there was no way that was going to work, so when he asked for my number I gave him the number of the banks time and temperature line. A couple of years later I saw he was named Mr. Basketball. I felt a little guilty for not giving him my real number. We stayed at a lot of hotels and once we stayed at a really run down hotel. It looked like something out of a horror movie. It was made even scarier when it became surrounded by police and an ambulance. We later found out the owners got in a fight and the wife stabbed her husband. A band members dad was a cop while waiting to pick up his kid he saw a crime in progress and arrested someone right beside practice. The kids stopped marching and started clapping and cheering. Picture it the first football game of the season and a packed house. A very tall (over 6 foot) kid turns around while marching the show. His back is facing the crowd, and his pants fall down. He grabs them with one hand and pulls them up, but not before everyone sees his underwear. In good fun he received animal print underwear for every Christmas after that. During a hotel stay while the band was away competing the maids, smoked pot in the room and then left the butts in the toilet. They crushed up gold fish crackers and put them in the coffee pot, put the blankets on the floor and the pillows on the foot of the bed. Someone put her flat iron in the freezer to cool it down before sticking it in her bag. She forgot to get it out and left the flat iron in the freezer. This one time at band camp we were on the field practicing and a truck drives by a couple of times with guys in the back. We look up as the boys drop their pants and moon us.